As one of the leading meat marketers in Austria, ALPENRIND places great importance on quality products. In order to meet the high standards of customers, the company itself conducts a number of strict control and quality processes, as do independent authorities at their request. Before a product leaves the plant, it is controlled many times. Already during the delivery process, highly trained veterinarians look after checking the live cattle. Recognized certificates and quality seals support and show these high standards. Only those products that comply with the strict guidelines are awarded the certificate and the seal of quality. Protection of the environment is also a matter of our concern. We use numerous measures in our corporate environmental management program to deal as responsibly as possible with the natural resources. The quality of the products starts with the farmer whose expertise flows into the care and feeding of the animals. Equally important of course is species-appropriate handling and respect for the animals. Compliance with the Animal Welfare Act comes first at ALPENRIND. By carefully selecting partners, ALPENRIND guarantees quality raw ingredients and the shortest possible transport routes, which also benefits the quality of the meat. 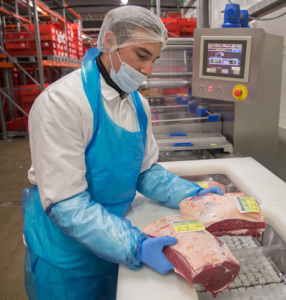 ALPENRIND also ensures full traceability with proof of origin of the meat – from delivery of the live cattle to shipping of products to a customer. A sophisticated recording and labeling system provides extensive information about each product at any time. In addition to the statutory provisions, ALPENRIND salzburg participates in a voluntary labeling system called “bos®”.